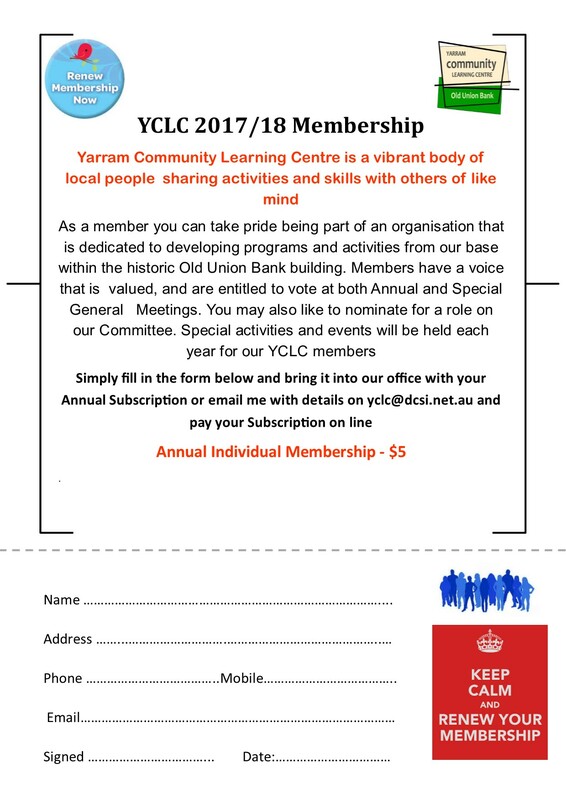 Yarram Community Learning Centre is a vibrant body of local people sharing activities and skills with others of like mind. We invite you to get involved by becoming a member or a volunteer! As a YCLC member you can take pride in being part of an organisation that is dedicated to developing programs and activities for our community. Members have a voice that is valued, and are entitled to vote at both our Annual and Special General Meetings. You may also like to nominate for a role on our Committee. Members are welcomed at special activities and events we hold each year. 2017-18 individual membership is just $5. Our vision is to grow YCLC into a thriving community space where community members of all ages can connect, learn and prosper. To achieve this, we need volunteers to get involved in all aspects of what we do. Volunteering is a great way to meet new people and make a contribution to your community. We’d love to hear from you and you will be warmly welcomed as a volunteer at YCLC. Contact us to find out more about membership and volunteering.